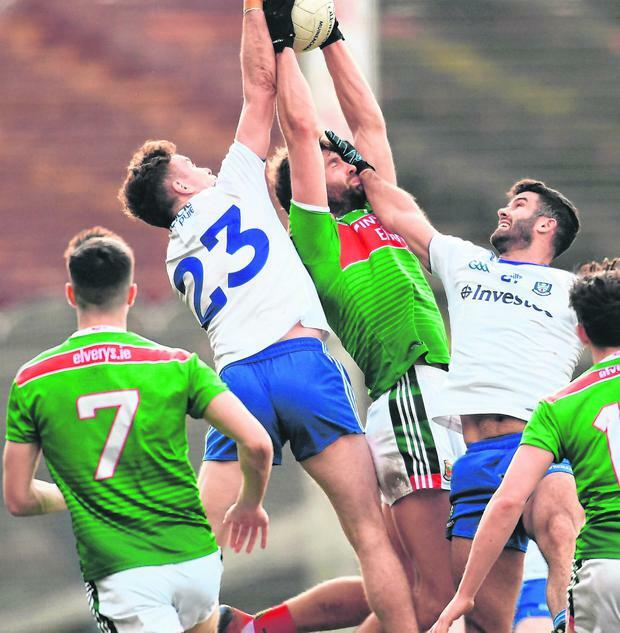 Having flirted with relegation in recent years, James Horan's second coming combined with last summer's early championship exit has helped re-energise Mayo as they set their gaze on Sunday's League decider. Final treks to Croke Park are littered with heartbreak for Mayo's unbreakable fans but Horan will be out to buck that trend against Kerry having failed to make it to GAA HQ last year after a disastrous campaign. Kevin McLoughlin's impressive tally of 2-2 - and a fortuitous own goal in the second half - proved crucial in their defeat of Monaghan after an entertaining affair at Elverys MacHale Park yesterday. Horan definitely had luck on his side with an extra man for the closing half-hour after Fintan Kelly's harsh dismissal, while Patrick Durcan cleared off the line from Jack McCarron in the dying seconds after a spirited Monaghan fightback saw them claw back a seven-point half-time deficit when trailing 2-7 to 0-6. Tyrone also did them a favour in Omagh when coming from behind to trump Galway. The Mayo boss cut a relieved figure after they had booked their first League final appearance since 2012, when he was also at the helm. "We were probably lucky," Horan said. "The bounce of the ball went our way and not Monaghan's. They might have felt harshly done by with some of the decisions. I would say they were. We were lucky to get out in the end." 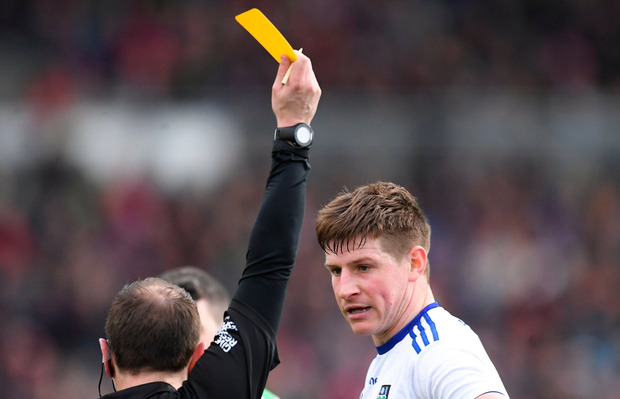 While results elsewhere ensured Monaghan would continue to ply their trade in Division 1 next year, Farney boss Malachy O'Rourke wasn't shy in hiding his displeasure with some of the decisions made by Tipperary referee Derek O'Mahoney. O'Rourke also feels that ace attacker Conor McManus isn't being protected by referees, with the Clontibret star denied what looked like a blatant penalty in the first half. "I think, talking to a lot of neutrals and talking to the Mayo people as well, they were the first people to say to me 'the referee gave us an awful lot today'. I don't know, I'd always have a sort of a bias," O'Rourke said. "I just think at the minute Conor is having to fight very hard to get any sort of free and at the other end it seems the frees are being given a lot easier, and that is really frustrating for us and frustrating for him. "I don't know why that is. That's the sort of things we've to fight against. If everyone gives frees for the same thing there's no problem and referees have different styles, but we will see how that one pans out over time." 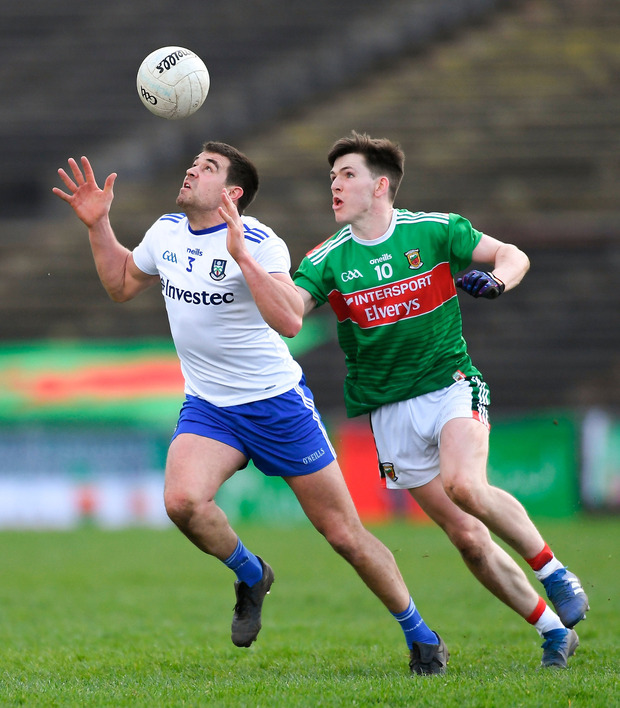 McCarron was in irresistible form for Monaghan and kicked them into an early lead with one of his five first-half points, but it was Mayo who got a dream start with McLoughlin firing a sixth-minute goal to settle any nerves. Aidan O'Shea cut the Farney defence apart with a sumptuous delivery and McLoughlin - playing on the inside line as opposed to his regular slot in the half-forward line - did the needful. Karl O'Connell could have done likewise almost immediately at the other end, only for an excellent save from David Clarke. The two-time All-Star goalkeeper was forced off just before the break following a heavy knock, but his side were in total control with the diminutive Fergal Boland kicking three exquisite first-half points. Were it not for McCarron, Mayo would have been out of sight, with McLoughlin's second goal in the 31st minute helping the hosts into a comfortable half-time advantage. Kelly's red card - for a dangerous-looking shoulder to Boland - looked likely to hand control to Mayo, but the visitors refused to wilt and Darren Hughes' 49th-minute goal left just three between them in a pulsating second half, 2-10 to 1-10. Mayo would go right down the other end, however, with Rory Beggan denying McLoughlin his hat-trick with a stunning reaction save only to see the ball rebound into the net. When McLoughlin kicked them eight ahead, 3-13 to 1-11, Monaghan's goose looked cooked but with Conor McManus unerring from placed balls - and McCarron still a danger - they reeled off six points in a row. The 13,287 in attendance were on the edge of their seats with just two points separating the sides, but captain Diarmuid O'Connor stepped forward to stem the blood loss for Mayo as they held on in an exciting finish. Mayo - searching for their first League crown since 2001 when they meet Kerry next weekend - mixed the good with the bad and their usual rock-solid defence was a cause of concern for Horan. "Some of the scores we got were brilliant. Aidan O'Shea's ball in and James McCormack's ball in for a couple of scores were top class but then some of our defending in the second half was equally as bad," he said. "We are still a bit up and down but we are definitely progressing on some of the key things so we are happy with that. I thought we were very sloppy in the second half and we will try and fix those things for next weekend." Horan reported Tom Parsons to be "progressing well" from his horror knee injury last summer while Cillian O'Connor is also on the comeback trail - he trained yesterday - ahead of another tilt at Sam Maguire this summer. For Monaghan and O'Rourke, it was a case of job done with Division 1 status maintained, although not in the manner he had wished. They have eight weeks to hone their preparations for an Ulster SFC quarter-final away to Cavan on May 18. SCORERS - Mayo: K McLoughlin 2-2, F Boland 0-3, R Beggan (og) 1-0, J Doherty 0-2 (1f), B Reape (m), A O'Shea, D Coen, D O'Connor, B Harrison, R Hennelly (f), D Vaughan, J McCormack 0-1 each. Monaghan: C McManus 0-8 (5f), J McCarron 0-7 (1f), D Hughes 1-0, R Beggan (f), C McCarthy, R McAnespie 0-1 each. MAYO - D Clarke 7; B Harrison 7, S Coen 6, E O'Donoghue 6; P Durcan 7, C Barrett 6, J McCormack 7; M Ruane 6, A O'Shea 8; F Boland 8, J Doherty 6, D O'Connor 7; K McLoughlin 9, D Coen 7, C Diskin 6. Subs: B Reape 7 for Diskin (blood 31), R Hennelly 7 for Clarke inj (34), J Gibbons 5 for Ruane (blood 48), D Drake 6 for O'Donoghue (56), J Carr 6 for D Coen (59), D Vaughan for McCormack (68), C Treacy for Boland (74). MONAGHAN - R Beggan 7; B Kerr 6, D Wylie 6, R Wylie 7; K O'Connell 6, C Boyle 6, K Duffy 6; D Hughes 7, N McAdam 6; F Kelly 5, D Malone 5, R McAnespie 7; C McCarthy 6, J McCarron 9, C McManus 9. Subs: S O'Hanlon 6 for Malone (half-time), D Mone 6 for McAdam (49), V Corey 6 for D Wylie and J Mealiff 6 for O'Connell (both 60), O Duffy for McCarthy (68). REF - D O'Mahoney (Tipperary).